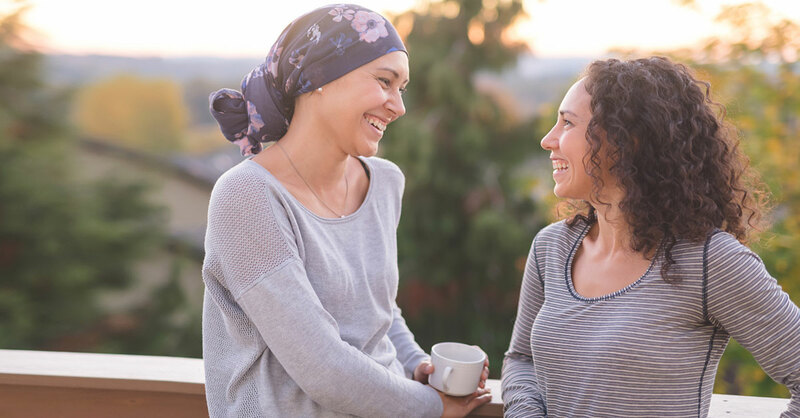 You’d never consciously abandon a friend who has cancer, and yet that’s the message many people inadvertently send…either by not reaching out at all or by changing the topic to something less threatening whenever the friend brings up his/her illness. Of course, you want to be supportive—it’s just that you feel helpless or unsure of what to say. Some people blurt out platitudes (“This is all part of God’s plan”) or share their own cancer stories (or those of people they know), none of which is helpful. Acknowledge your helplessness. It’s OK to be at a loss for words after your initial expression of sorrow. What’s important is to take your cues from your friend, and that starts with listening to find out what he needs. Reach out repeatedly. Maybe your friend didn’t respond to your initial e-mail or phone call because he was feeling overwhelmed. Don’t give up! Let him know you’re thinking of him with a text, an e-mail, a card or a phone call every other week. Is he your best friend? Then reach out more often—at least once a week. One of the trickiest parts of being a cancer companion is knowing when to reach out and when to stay away. While you do need to respect boundaries and overt requests to be left alone, remember this mantra—when in doubt, reach out. People who are struggling often need time and space to go into exile. Grief and coming to terms with mortality invite interior struggles and demand this alone time. But remember—if you do end up “bothering” him, chances are your efforts to be present will far outweigh any inconvenience you may cause. Lend a hand. When you do call, be straightforward and ask, “What do you most need help with right now?” Then follow through, whether it’s cleaning his house, doing laundry, shopping for groceries, buying birthday gifts for a loved one or transportation to doctor appointments. And keep offering every so often, even if your friend turns down your request the first time, realizing it can be hard for him to admit needing such help at first. It may help to be specific—for instance, if you know she has children who need to be shuttled to soccer practice, offer to drive them. It’s easier for your friend to say, “Yes, thank you,” than to try to figure out what to ask for. Squelch your inner cheerleader. It’s important to frequently ask “Is there anything you’d like to talk about?”—and then let your friend guide the conversation. If he’s feeling pessimistic, don’t try to “talk him out of it” by telling him that he’s got a great doctor or that the odds are in his favor. The last thing he needs is a cheerleader. That’s because you need to match his emotional tone or he’ll feel disconnected from you. If he needs to befriend sadness, let him be sad. If you project that you can only accept happy emotions, he cannot be authentic with you and will often not want to be in your presence. Instead, simply allow him to express his fears, grief and any other emotions he’s going through. Your empathetic reaction can make him feel hopeful again. When words seem inadequate, simply remind yourself that a great way to support your friend is: Mouth closed, ears open, presence available. Empathy is being in tune with what someone feels, not trying to change it. Get comfortable with long pauses. It’s easy to feel uneasy when conversation tapers off. But if your friend doesn’t want to talk—or is too distressed to speak or simply isn’t really a talker—stay silent until he’s ready to open up. Remember that just your being there is meaningful for your friend. Often, it means listening and overcoming the need to say something in return. How do you “listen” to silent types? By simply spending time with them. You might play cards, watch a movie or fold laundry together…and find that communication—verbal or nonverbal—happens naturally. One thing that may help your friend communicate more easily is the EmPat Project—special “cancer” emojis created by artist Nina Beaty when she was undergoing treatment for lung cancer. Available through a free, downloadable app that you can add to text messages, these emojis rely on cute, funny drawings to telegraph a person’s thoughts and moods. They’re excellent shortcuts for saying “I’m overwhelmed” or “I’m having a good day” without having to overexplain. The bottom line: It’s not always necessary to talk, but always keep your ears open, and be available and present. Your friend will quickly realize that he can count on you to be part of his support system.